Pop culture snap … and, go! Sherpas doing their thing on Everest. The subject of a gripping Australian doco. Sucker, a feature film by a mate of mine, Lawrence Leung, just had its world premiere at MIFF. It’s a lot of fun and bounces along, with conmen and conwomen playing angles in all directions. It’s in cinemas later this year and I’d definitely recommend it. I’m inspired enough that I’m spending the morning digging back into my one hundred year old copy of the autobiography of one of my all-time favourite magicians, the French pioneer Robert-Houdin. At MIFF, Chloé and I also saw Racing Extinction, which I almost had to walk out of when there was footage of a manta ray being murdered, live in screen, but it’s a well made doco by the maker of The Cove. Can we save the world? It seems like there are a lot of parties working to destroy it, but at least some people are having a crack the other way. For the flipside of that, we watched Sherpa: Trouble on Everest, which has been described as the most awesomely visual industrial relationships dispute in cinema history. 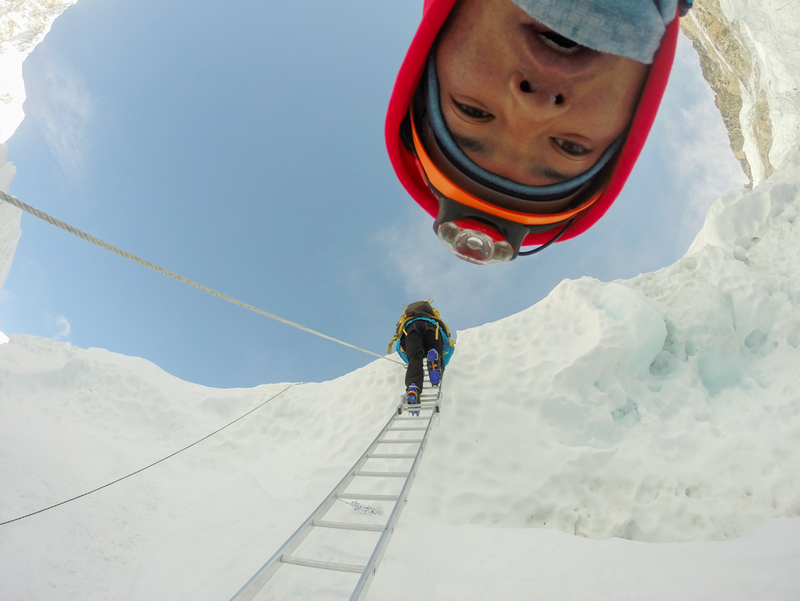 It follows the ill-fated 2014 season on Everest, as dozens or maybe hundreds of westerners line up to tick the world’s tallest mountain of their bucket list, while Sherpas, the local people and the ones who make it happen, become increasingly and reasonably upset. To change things up, we also went to the vintage Australian classic Storm Boy, which totally holds up all these years later – and was a time capsule of the exact fashion I used to wear to primary school in the mid-Seventies. The film had me from that moment: even before I realised Eric from True Blood (Alexander Skarsgård) was a co-star. On the small screen, I’ve been digging the Fred Vargas collection, a French detective series, apparently based on best-selling books. All I know is that the character development and the relationships between the characters, are brilliant. In music, well I still listen to everything and anything. I’m loving, in no particular order, Get Direct by Joan As Police Woman, Red Eyes by The War On Drugs, Don’t Come Knocking by Kitty, Daisy & Lewis, Ginette (a mighty mighty song) by Têtes Raides, which pretty much makes me cry every time I hear it, Fade Out Lines by The Avener, and I Will Follow You into The Dark, by Death Cab for Cutie. Feeling old skool? Try Rain Rain Go Away by Lee Dorsey or River by Joni Mitchell. And reading … The New Yorker has had some incredible articles lately, particularly this one about the Cascadia fault line, lurking like a timebomb off the north-west coast of the USA. I wouldn’t be buying real estate in Portland any time soon, and man, it’s a scary article – about nature and also about the inability of humans to pre-plan. I’ve been roving between books. Will Brodie’s Reality Check is a brilliant read, even if you’re not an Australian ice hockey tragic like me. Nicholas J Johnson has backed up Chasing The Ace with Fast And Loose, and hasn’t dropped any quality. No second album syndrome happening with the Honest Con Man, so bravo to him. Plus I’m reading The Frood by Jem Roberts, which is sort of an officially authorised by his family unofficial biography of Douglas Adams, of whom none of us are worthy. Roberts has written about British comedy for a while and manages not to veer into fandom or gushy writing. Adams’ insecurities, the moments of creative despair pre-Hitchhikers Guide To The Galaxy and other under the hood realities are there, along with the rockstar friendships and his soaring success. I think all writers, across disciplines, know that despair and the endless insecurity. Keep putting one foot in front of the other and believe, people. That goes for you too, Place. Eagles of Death Metal. Oh Hells, yeah. Finding Vivian Maier was enjoyable and oh man, her photos are sublime. The more I’ve thought about the doco, though, the more it’s sort of annoyed me for not following the threads and answering the questions raised. It’s a semi-professionally made work, and by a guy with a vested interest. If you Google Maier at the moment, you’ll see the legal battle going on for her estate. The answer appears simple: let the guy who discovered her, John Maloof, take a straight-up and well-deserved agent’s fee on every sale, and to reward his hard work and time. Everything else doesn’t go to far-flung maybe relatives who wanted no part of helping Maier when she was alive: instead it should go to a foundation for street photographers and/or homeless former nannies. Job done. US Courts, are you listening? Rant over. 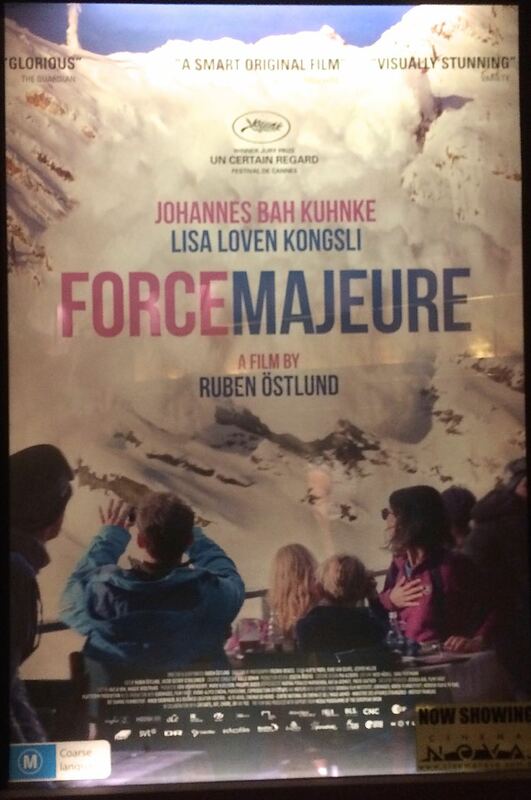 Force Majeure is a fantastic Swedish film about the fallout when a family man doesn’t behave as is expected in the face of a natural disaster. Such a refined, considered, expertly paced and well-acted film. On TV, the French series The Returned blew me away and I can’t wait for series two to be filmed and released. The Bridge started dubiously but hooked me by the end, and I love that it didn’t take any Hollywood shortcuts. The Code wasn’t bad, and it was good to see a high-quality Australian drama, but it didn’t quite grab me in the same way. Maybe trying to be too cute? Black Comedy, on the ABC, has enjoyed some seriously funny moments – especially Black Force and the Indigenous car GPS. Laugh Out Loud, as I believe the kids like to say. One of my favourite artists, Be Free, created a cracking piece on Scotchmer Street, on the wall of the vet. Adding a 3-D vacuum cleaner to her usual art was beautiful. 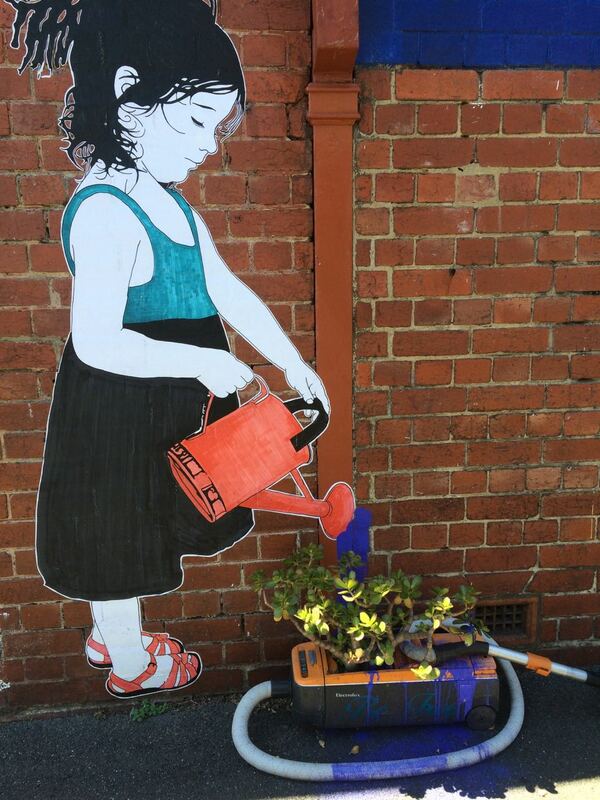 Be Free goes 3-D in Fitzroy North. Moriarty, with a special mention for the song Jimmy. So many awesome discoveries lately. How did I not know about James Carr, until I shazamed him at the Meatball & Wine Bar, after seeing King Kong at the Regent? The soundtrack from the Girls TV series is awesome, too. Especially Tegan and Sara’s cover of the Stones’ classic, Fool to Cry. Cookin’ on Three Burners and Granville (the latest discovery from France, thanks to my partner, Chloe) are also on high rotation. Esther Hannaford gets close and personal with an ape. King Kong at the Regent Theatre: I’m so happy for the Melbourne company that created and produced this new musical. The huge Kong puppet/robot is fantastic (as is the reveal, on stage) and Esther Hannaford, as Ann Darrow, really impressed me. The story of King Kong has always been sort of flawed, and it’s hard to cover that on-stage, but I really want this production to fly, all the way to its inevitable home on Broadway.The best thing is that the promotional campaign over there could be exactly what is described in the story: ‘See the eighth wonder of the world, King Kong, on stage.’ (And then don’t let anybody see the puppet/robot until it makes its appearance.) Too cool. Sophisto-Punk, by Jeff Jenkins and Luke Wallis. Jeffy is a mate of mine, so, I’ll be honest, this bordered on being an obligation read, but the second I started reading, I was hooked. Every band I grew up with, crazy stories of growing up and of the Australian rock scene. It’s a great read. and, to play something loud: Jackie Onassis with ‘Crystal Balling‘. I also really enjoyed the new Tarantino, Django Unchained. Just finished ‘No Angel‘, a book by a US undercover federal agent who infiltrated the Hells Angels. (Hint to potential storylines in the sequel of Roll With It, right there). Also got deeply into the latest Wired magazine with its awesome celebration of all things Star Wars.